Vernessa T. Pollard is a Partner in the law firm of McDermott Will & Emery LLP in Washington DC. 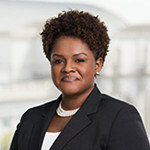 As co-chair of the Firm’s FDA practice, Vernessa provides strategic business and regulatory advice to biotech, medical device companies on complex issues related to the development, manufacture, marketing, post-market safety and compliance of FDA-regulated products, including digital health and mobile devices. She counsels companies on product development and premarket strategy, good manufacturing practice and quality system requirements, advertising and promotion, adverse event reporting, FDA warning letters, FDA inspections, recalls, import detentions, corporate compliance programs and regulatory due diligence in mergers and acquisitions. Vernessa is passionate about working with life sciences companies because what they do and how they do it has the potential to change lives and improve healthcare in remarkable ways. She has been recognized in numerous Law and Life Sciences publications.